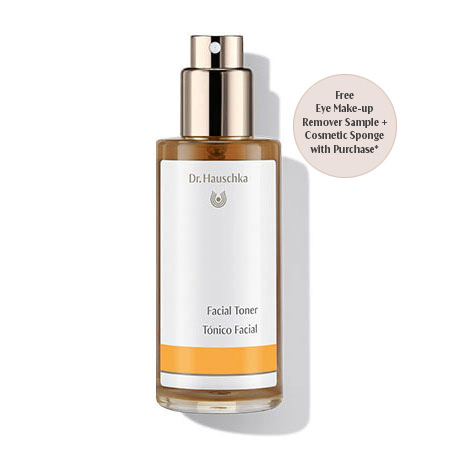 Facial Toner supports the skin’s natural processes of cleansing and renewal, minimizing the appearance of pores, balancing moisture and oil content, and leaving skin looking and feeling healthy, toned and radiant. Formulation: Anthyllis extract helps skin remain balanced and healthy. Witch hazel extract supports tone and elasticity, refining pores. Skin Condition: For normal, dry, mature and sensitive skin. Refreshing, calming, and smells very pleasant. This is the best toner I have ever used. This is the best toner on the market. It keeps my face feeling moist and fresh. The added bonus is that is smells of roses - and not just the normal "Well, duh. It's ROSE WATER" kinda of smell. My kids ask for a quick spritz every time they see me use it; it's like a magic mood lifter in addition to being a great skin product. This toner lives up to its promises. It makes my skin feel refreshed and it does a great job balancing my skin. I’ve been using this product for more than 3 years. I still have to take a moment to enjoy the earthy scent as I’m applying the toner. Try it I’m confident you’ll love it as much as I do. I use this toner with a couple sprays over my face. It is not astringent but rather soothing and refreshing for my sensitive and dry skin. This is a wonderful product that I have been using for many, many years. It never disappoints! A key component of my skin care regimen. I use this with the cleansing cream and my skin has never looked better. I enjoy the refreshing and toning effects of this product. It's not too astringent but provides the finish to my washing routine. It moistens my skin in preparation for serum and moisture. The title of my review is not surprising because this product has alcohol in it which is drying on my sensitive skin. However it does impart a glow and I liked the aroma. Thank you for your comment. Many Dr. Hauschka Skin Care preparations are extracted in a mixture of alcohol and water. We use a certified organic food-grade ethyl alcohol (ethanol) from wheat. Alcohol also serves as a natural emulsifier, preservative and carrier, helping ingredients penetrate the skin. Alcohol is not drying to the skin when part of a carefully formulated Dr. Hauschka composition. Isopropyl alcohol is never used. Please contact us if you would like more information. Have used this product for about 30 years. Nothing else like it. I have very dry skin and along with the rose day cream thats all I need. I can’t imagine a day without it. After cleansing my face I close my eyes and spritz this wonderful fragrance while I pause and just breathe. One of my favorite things I look forward to a least once a day. I have used this toner for years. I have tried several other organic, high-end toners but always return to this one. It smells amazing and it makes my skin look and feel amazing. Perfect after using Dr. H cleansing cream. It’s really the best! This toner is really nice, mostly for its softness and wonderful, natural invigorating but pleasant scent. Doesn't dry out skin or leave a sticky texture. Been using it for several years. Works great under moisturizer and liquid make up. Love this toner. Leaves my skin refreshed and vibrant. of my skin since adding this toner to my face regime. that only natural non harmful ingredients are used. I have been using the facial toner for a long time now. I love the way it settles into my face. I don’t feel it is product that gives you an extra cleanse but that is not what it is suppose to do. It does give you a palette for your next steps. I prefer the clarifying toner after trying both. I have combo skin though, I think this is better for people with dry or sensitive skin may be? This is the best toner that I've tried. It never dries my skin and actually balances the moisture level. I've been using this facial toner for around 30+ years now and it never disappoints. Leaves my skin feeling fresh and young, and I'm nearly 60! I love the way it smells too! 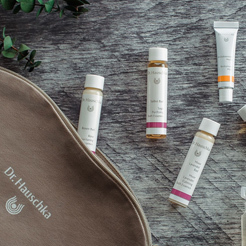 Dr. Hauschka never fails to disappoint. This toner is light and natural. It smells like heaven and it makes my skin feel so clean and smooth! Nice fresh feeling and not drying. This feels great after cleansing. Love the light scent. I love the convenience of this toner as a spray. Feels good on my skin. This feels good on my skin as I love the mist and it feels refreshing, however I don't know that I've actually seen any difference or change in my skin since using. I had my doubts about this toner at first but immediately I knew this was the one. It is easy to apply to my face with the spray bottle. I personally got the travel size for starters and it lasted me about 3-4 weeks. I would recommend this toner to anyone. After a year of having really inflamed skin, switching to Dr. Hauschka has been very helpful. I've used a lot of toners and this one leaves my skin feeling refreshed, balanced, and calm. Would recommend. Noticed a major difference in skin's moisture retention only days after using the Facial Toner! Never thought it would make that much difference, but found less serum and moisturizer required with use of Toner. Love this toner! It balances the skin and creates a good foundation for the serums and creams. 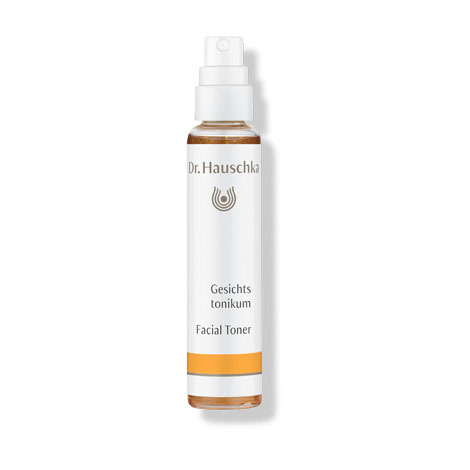 I have used Dr. Hauschka's Facial Toner for quite a few years, and love it. I had some serious skin issues on my face, and so am wary of products. These have helped me to maintain healthy skin. A nice product but again I am concerned about alcohol being the second ingredient,something sensitive skin doesn't need. At first it imparts a moist glow but when it dries,so did my skin. Uncomfortably. Much more pleasant smelling than the Cleansing Milk. I haven't used toners in years - too drying or harsh. I've become a fan of Dr. H. generally this past year, so tried this one. I've been using it for a few weeks. I like it. Use it typically once a day (not both AM and PM). Also use several other Dr. H. products (serums, moisturizers, and eye makeup) which I like as well. The best tingles. Need a larger size!! Love the fact that comes in a spray bottle. Very refreshing and smoothing. Like using it/mixing with the clarifying powder mask. This a such a great daily toner. I use it in my morning and evening skin routines. It is gentle and makes your skin feel instantly refreshed. The scent is nice and light. My skin immediately soaks this up. It’s a perfect start to my skin care moisturizing.. very gentle scent and has helped clear my skin. I even use a few more sprays late in the day before teaching dance to feel (and look) refreshed. I’m on my third bottle. Highly recommend! I use this as recommended daily. But it is also works great on a cotton ball when you're in a hurry or on the go and need a quick facial pick me up. Very gentle on my skin and refreshing. It lasts a long time using it twice a day. Highly recommend this toner. Refreshing fragrance to finish cleansing skin. I love this facial toner! I have been using it on my face twice a day for a few years now. It is non-drying and works well on my sensitive skin. It helped me through my rosacea times. Great product! My skin feels instantly refreshed! It never stings. I love the fragrance. I have used it for years and can't be without it. Always refreshing! Works great after cleansing. After cleansing in the morning and evening, mist evenly onto the face, neck and décolleté then gently press into the skin. Mornings: follow with an appropriate day moisturizer. Evenings: no moisturizer is needed. We recommend cleansing with Cleansing Cream for normal and dry skin. Soothing Cleansing Milk is recommended as a cleanser for sensitive skin and make-up remover for all skin conditions. Men will enjoy Facial Toner as a revitalizing aftershave.